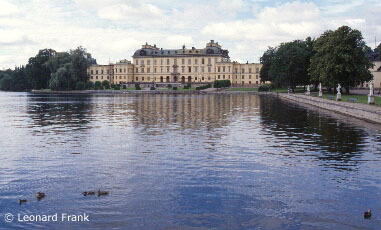 Drottningholm is most becomingly situated in the southern part of the lush Lovön island in Lake Mälaren, about 15 km from central Stockholm. The Royal Domain contains a grand Baroque Palace (constructed in the 1660's), a Chinese Pavilion, a 18th century Palace Theater (still giving performances of 18th century plays and operas with preserved original sets) and several huge parks, some in the formal French style and some in the "natural" English style. The Drottningholm Baroque Palace is presently the residence of the King of Sweden and the Royal Family, but the vast parks, the Chinese Pavilion, the theater and even parts of the Baroque Palace itself are open to the public.